John Wilcockson and the editors of VeloNews magazine reveal the inside story of the 2007 Tour de France in a newly published book. The 2007 Tour de France: A New Generation Takes the Stage gives the scoop on a race that exploded with surprises. Follow the four jersey winners through the Tour and read race diaries from pro riders Christian Vande Velde and Simon Gerrans. The book is now available in book stores, bike shops, and at VeloGear.com. In turns contentious, controversial, and compelling, this Tour began amidst record crowds and brilliant pageantry in a London send-off, and ended with victory by a young Spanish rider who had survived brain surgery and the death of his brother on his way to his first Tour crown. The 2007 Tour will be remembered equally for epic battles in the Pyérnées, stage 19's dramatic race-deciding time trial, a horrific litany of crashes that took down the Tour's brightest stars, and a steady stream of doping scandals that saw pre-race favorite Alexander Vinokourov kicked out of the race after returning a positive test for an illegal blood transfusion, and race leader Michael Rasmussen dismissed by his Rabobank team for skirting dope tests. By the time the race reached Paris, two teams had been sent home, a third was engulfed in controversy, and a fourth-the winning Discovery team, home to seven Tour victories under Lance Armstrong and a fresh win with Alberto Contador-had announced that it would cease operations at season's end. It's a story no one could have predicted, and one you have to read to believe. 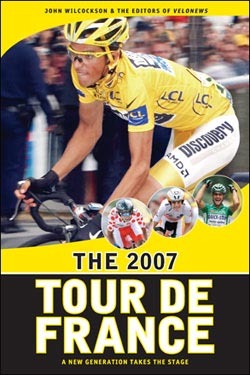 Reported by Tour veteran John Wilcockson and the VeloNews editorial team, and containing the race diaries of riders Christian Vande Velde (Team CSC) and Simon Gerrans (Team Ag2r), The 2007 Tour de France is the fascinating record of a shocking and unforgettable race. 16-page color photo spread by Graham Watson.